Schmidt’s observations offer insight into a culture that increasingly disregards the intangible in favor of the certain. It seems that in a culture focused on looking ahead, an individual who pauses to look back will be left behind. Yet in the process of doing so, many American undergraduates have failed to learn what it means to reflect not only upon the lessons gleaned from history, but upon their own past as well. As American higher education systems lose interest in the study of history, they drift further from their mission to teach critical self-reflection. College students do not learn what it means to remember who they are and where they come from. The American liberal arts education system regards the task of a liberal arts institution as twofold: colleges must develop both the academic competence and the personal conscience of their undergraduates. This pursuit of moral development serves as a cornerstone of the liberal arts experience, encouraging students to form identities rooted in ethical excellence that empower them to serve a human purpose greater than their own. Identity is necessarily dependent upon an individual’s capacity to reflect upon their own experiences. who people are is not based upon ambition, but upon a critical reflection of who they have been. A study of human history teaches students of humanity’s equal capacities for greatness and horror. By studying their own history, students can derive similar lessons that connect to their own experiences. They learn that the truth is neither simple nor easy — truth can be an uncertain cloud of changing conclusions that evolve over time with experience. Ample reflection can clarify these conclusions. Yet in today’s era that regards history as antiquated and impractical, students too often rush through their educational experience without affording a backward glance at their own story. Self-constructed identities in graduating students have become an accepted sacrifice in the rat race to success that college students now run. Undergraduates across the United States forfeit the chance to define their identities and aspirations in pursuit of the prestige that they hope will reward them for playing by the rules of a game with little regard for personal growth. Dartmouth is a prestigious institution known for the excellence of its graduates in their chosen fields. The College’s liberal arts curriculum, numerous extracurriculars and support of departments in a wide variety of fields all seem to indicate at first glance that Dartmouth gives undergraduates the opportunity to explore both their passions and senses of self. While the College does offer many opportunities for students to gain academic and leadership experience, the vast majority of these prospects focus on professional development over personal growth. As graduate schools and employers earnestly select for leadership and work experience, many students search for ways to fulfill this requirement with no real passion to accompany their responsibility. Students flock to majors like economics and government that they likely believe will offer them the greatest return on investment. The number of students majoring in the humanities has plummeted in recent years – the ever-growing belief that college is just another rung on the ladder to success feeds this trend. Dartmouth’s website claims that the College is committed to “combining its deep commitment to outstanding undergraduate liberal arts and graduate education with distinguished research and scholarship.” As one of the top-ranked schools in the country, Dartmouth is laudably fulfilling its mission to foster distinguished research and scholarship. Still, this campus culture that prioritizes success above all else neglects Dartmouth students’ obligation to reflect upon the past as well as the future. 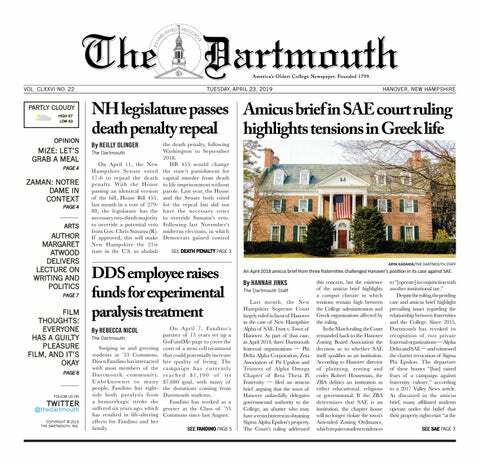 As a liberal arts institution, Dartmouth must remember its responsibility to foster the reflection and remembrance students need to achieve personal growth.